Summary: Paradigm shifting research in cognitive neuroscience in areas called embodied and embedded cognition and equally important research on what are called embodied and enactive approaches to emotion in universities in the last twenty years have been significantly altering our understanding of cognition, emotion, behavior, how they are intricately related to each other in the brain, and how they involve and interact with each other in the body. These findings, because they offer radically new insights on these familiar topics in ways that question the effectiveness of the typical ways in which psychotherapies (including those that are body oriented) work with these phenomena, suggest new methods for significantly improving cognitive, emotional, and behavioral as well as physical, energetic, relational, and spiritual outcomes in all therapy modalities. This forms the subject of this short paper. What is included in a definition of cognition varies by research tradition. When defined broadly, it includes attention, focus, perception, symbolization, language, categorization, contextualization, association, imagination, memory, recall, logic, inference, and meaning, the definition used in this paper. According to the increasingly evidence-based theories of embodied and embedded approaches to cognition (Colombetti, 2014) and the embodied philosophy of mind (Johnson, 2017), all these aspects of cognition involve not just the brain but also the entire body as it interacts with (the body of) its environment. A number of experiments have established that the learning of simple phenomena such as letter recognition in kindergartens as well as the learning of complex phenomena such as the physical law of inertia in university classes is markedly improved when the body and the environment are more involved in the learning process (Beilock, 2017). Therefore, any aspect of cognition starting with attention cannot be understood just by studying the brain. Working with the body in relation to its environment in addition to the usual work with the brain would improve all of the above-mentioned cognitive outcomes in therapy. There have been findings in the past that link cognition to the body in body oriented psychotherapies. Eugene Gendlin (1998), philosopher turned psychologist and founder of Focusing Therapy, demonstrated through experiments at the University of Chicago that people who involved the body minimally by being aware of body sensations from time to time did better at solving cognitive problems than those who did not. Bodynamic Analysis (Marcher & Fisch, 2010), a Danish body psychotherapy system with an empirically derived map of psychological functions of the muscular system, has identified several muscles in different parts of the body such as finger and toe flexors that mediate cognitive processing in the brain. What embodied cognition research has been able to offer of late is the science and evidence that neither Focusing therapy nor Bodynamic Analysis could offer at the time for the importance of the body in understanding and working with cognition. A number of recent studies in embodied cognition based on the physiology of the brain (Colombetti & Thompson, 2008; Johnson, 2007) have shown that all aspects of cognition (starting with initial decisions that determine which aspects of the environment we pay attention to even before our senses engage the environment in perception) are mediated, influenced, or even initiated by affect (we are here using the terms affect, emotion, and feeling loosely to mean the same). The new neurological evidence is in terms of observation of either simultaneous activation of known cognitive and affective brain areas or activation of affective circuits prior to the activation of cognitive circuits observed during cognitive experimental tasks or overlap in the brain areas engaged in cognitive and affective functions. The evidence for the causal role of affect in cognition comes from the discovery that there are more pathways from brain areas that have to with affect to areas that have to do with cognition and behavior than the other way around (Barrett, 2017). Whereas earlier research presented by Damasio (1994) showed the importance of emotion in understanding and working with behavior, the ongoing research on embodied and embedded cognition and enactive and embodied approaches to emotion show the importance of emotion and its embodiment in understanding and working with cognition. The role of the entire body in generating emotional experience is well documented (Barrett, 2017; Damasio, 2003; Pert, 1999). However, it is only of late that the involvement of the body in emotion has been used to establish the connection between cognition and the body. That is, emotion provides one possible link between cognition and the body (with behavior providing another possible link between cognition and the body). In experiments where facial muscles that have been known to play an important role in emotion are disabled in one way or another, cognitive processes such as imprinting and recalling of the emotions and their contexts are significantly compromised (Niedenthal, 2007). The finding that the entire body is involved in emotional experiences informs us that our understanding of emotions would be more complete and that our work with emotions more effective if more of the body is included. The findings such as Niedenthal’s that bring emotion, cognition, and the body together inform us that we need to work with the body specifically in relation to emotions and their availability to improve cognitive outcomes.They also inform us that cognition would suffer if the body were compromised in ways that its role in emotion is diminished. Past research on emotion focused on the brain compiled by Damasio (1999) has found significant evidence that emotions, contrary to the conventional wisdom that they are irrational and interfere with the rationality of cognition, improve the appropriateness of a person’s behavior by improving the generation of behavioral alternatives and the choice of the best course of action in any situation. These findings also offer indirect evidence that people are better able to understand the contexts they find themselves in (cognitively grasp the situations better) to act more appropriately in them when they have access to emotions than when they do not. The role of the body in behavior, expression and action, is obvious. And Damasio has observed that emotion has to occur through the body as an assessment before a behavioral decision is made. Research shows that emotion and cognition are so intricately interwoven in the brain and the body that they are virtually inseparable as they arise in the organism even though they can be somewhat differentiated in experience as separate phenomena. In every moment the affect state of the organism drives every aspect of its cognition starting with what the organism pays attention to in its environment. In fact, Duncan and Barrett (2007) go so far as to argue that affect is a form of cognition. Similar observations can be made of the relationship between behavior and emotion. In every moment, an organism is in a basic affective state defined in terms of valence (good or bad) and in terms of arousal (high or low). And every behavioral impulse has its basis or motive force at least this basic affect state therefore making affect and behavior also inseparable as they arise in the brain or the body even if they can be somewhat differentiated in experience as separate phenomena. Description of emotion as energy in motion and recent ‘enactive approach’ to emotion by Hufendiek (2016) are attempts to address the ultimate inseparability of behavior and emotion. 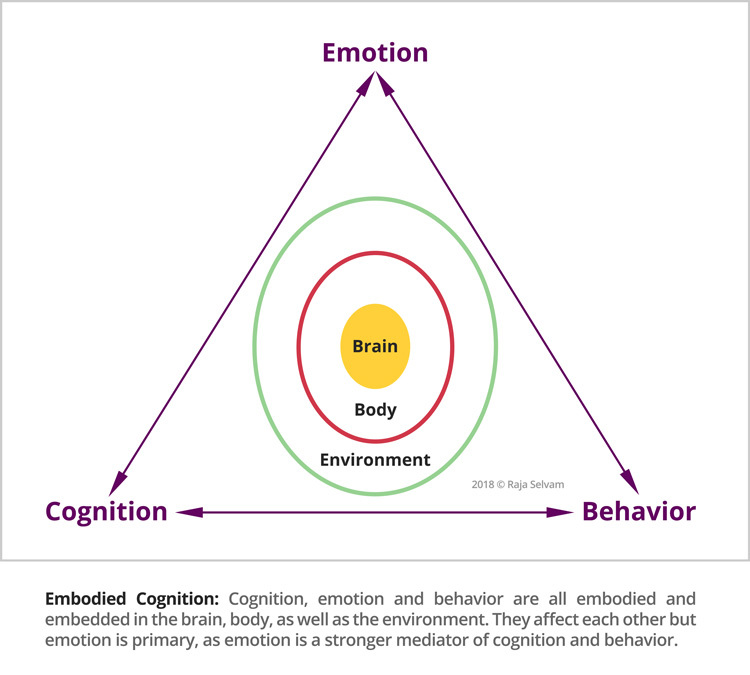 Embodied cognition research establishes the relationship between cognition and the body by establishing a relationship between cognition and behavior. All behaviors, expression and action, involve the body. We saw earlier that the learning of simple as well as complex phenomena is facilitated or inhibited by the behavior of the body. As for the inseparability of cognition and behavior in the physiology, even perception, an act of cognition, is now regarded as an action (behavior) and therefore virtually inseparable from it (Creem-Regher & Kunz, 2010). Also, the intentionality in a behavior is a meaning (cognition) and it is inseparable from the act. The inseparability of affect and cognition, of affect and behavior, and of cognition and behavior, and the primary role played by affect in mediating both cognition and behavior make the three inseparable as they arise in the organism even though they might be somewhat separable in experience. Psychotherapies tend to specialize in working with cognition, affect, or behavior, typically focusing on one more than the other two. Because we now know that the three are virtually inseparable, it makes sense that all these specialized therapies work to a greater or lesser extent because focused work on any of the elements would impact the other two elements as well. However, in order to ensure the best possible outcomes in therapy, these new findings suggest that we should 1) work with cognition, affect, and behavior in close proximity or association to each other and involve as much of the body as possible as all three are now known to involve the whole body; 2) work especially with affect because affect is now known to play a primary role in influencing or even initiating cognition and behavior; and 3) work with affect in relation to as much of the body as possible because affect is potentially a full body phenomenon and we know from body psychotherapy and psychiatry that overwhelming and intolerable affect can lead to physiological defenses in the brain and the body compromising their availability for cognition, affect, as well as behavior. Emotional difficulty is often if not always the cause of defenses in the brain and body physiology. The consequent reduction in the availability of emotional information in the organism on account of such defenses can compromise not only outcomes in the affective realm but also in the cognitive and behavioral realms that we now know through recent research are highly dependent on the affective realm and inseparable from it. The shutting down of the body due to physiological defenses against emotions can also compromise cognition and behavior that are now known to depend on the whole body in other ways than through the involvement of affect. The more the availability of emotional information in as much of the body as possible, the more regulated it is, the more bearable it is, and for a longer period of time (the definition of emotional embodiment in Integral Somatic Psychology™), the better the likelihood that the body is open and available to participate in cognitive, emotional, and behavioral processes; and the better the likelihood of improved cognitive, affective, and behavioral outcomes in all therapy modalities. To read an article on such emotional embodiment and how it can improve outcomes in all therapy modalities, please read How to Improve Outcomes in All Therapies Through Embodiment of Emotions?. The article also discusses how the current work with emotions in mainstream as well as body oriented psychotherapy modalities might be suboptimal due the lack of integration of important information on the complex physiology of cognition, emotion, and behavior, as presented in this paper. Also, more recent body psychotherapy approaches such as Somatic Experiencing® (SE™), Focusing Therapy, Sensorimotor Psychotherapy® (SP), and Mindfulness Based Stress Reduction (MBSR) Therapy often use detailed tracking of body sensations as a tool for working with the body. To read an article on how detailed tracking of body sensations, an otherwise effective and evidence-based tool, can at times compromise the work with complex experiences of emotions, cognition, and behavior, please go to How to Avoid Destroying Emotions when Tracking Body Sensations?. What is Integral Somatic Psychology™ (ISP™)? 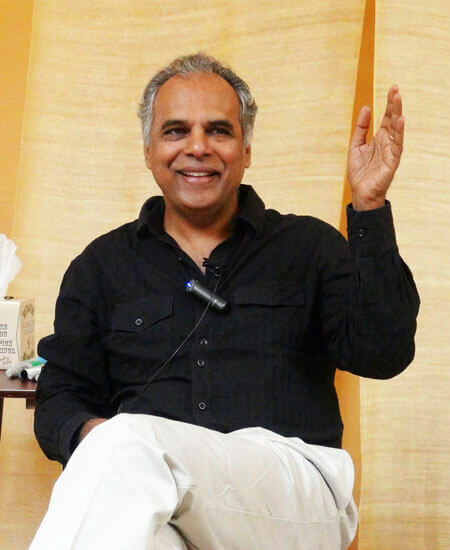 Integral Somatic Psychology (ISP) is the next generation in the evolution of body psychotherapy based on such latest findings from neuroscience, body psychotherapy, quantum physics, and energy psychology on cognition, emotion, behavior; how they are related to each other in the brain and the body, how they can be compromised by physiological defenses in the brain as well as the body; and how one can work with such defenses in the brain and the body to facilitate embodiment of emotions in simple, effective, and regulated ways to further improve cognitive, affective, and behavioral as well as physical, energetic, relational, and spiritual outcomes in all therapy modalities. ISP is currently taught in over a dozen countries. No prior training in body-oriented psychotherapy is required to enroll. To read an article on the theory and practice of ISP in a simple easy to read interview format, please read What is Integral Somatic Psychology? A Conversation with Raja Selvam. For more information on the approach, its further applications, and its international training schedule, please visit integralsomaticpsychology.com.